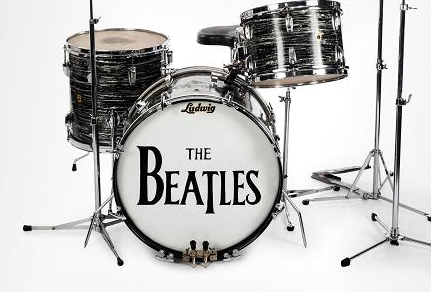 One of a kind memorabilia with a direct link to the artist always commands top dollar, but the amounts paid for Beatles artifacts at a Saturday (11/7) Julien's auction in Beverley Hills astonished even experts. A Gibson acoustic guitar John Lennon bought in 1962 and used in the writing of several early Beatle songs brought a high bid of $2.4 million. The logo bearing bass drum head from the kit Ringo played when the band appeared on The Ed Sullivan Show in 1964 was sold for $2.1 million. Pre sale estimate projected top bids between $850,000 and $1 million for the guitar and around $500,000 for the drum head. A baseball all four members of the group signed went for $100,000. A lock of Lennon's hair brought $25,000, the same price paid for a pair of his glasses.